Yes! 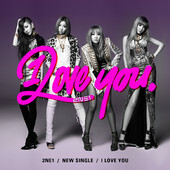 A WONDERFUL way to start the day with 2NE1's new song "I LOVE YOU" in FULL being just released! It's such a fresh song that will sure to be on the top of my playlist for the Summer. I love the slight electro goes crazy good with their voices.. it's very catchy and a sure hit in the clubs/on the dance floor!! I can't get the chorus out of my head.. "I LOVE YOU......"
The music video looks gorgeous.. can't wait to see the full version, until then you can watch the just released teaser. NEW SINGLE "I LOVE YOU"